You might be surprised to find the topic of succession planning on the blog of a floor care equipment company. However, recent events at our own company reminded us of the importance of this topic for all businesses. Tacony Corporation, our parent company, recently went through a leadership transition that was announced this January. Tacony’s ability to once again successfully transition to another generation of leadership is part of the underlying success of our own business, and helps make it the strong and flourishing company that it is today. Succession planning is the process of identifying and then developing the skills of the right employees for leadership positions within your company. 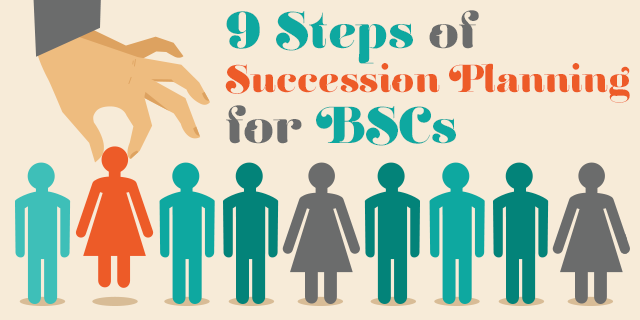 The unfortunate reality for many BSCs is that they have no succession plan. In fact, more than half of all privately owned businesses do not have a succession plan and are unprepared for a shift in ownership, whether through unexpected circumstances or planned retirement. Whether you are a brand-new BSC or one with leadership that is nearing retirement, you need a formal succession plan to ensure smooth and continuous operations. We have included three critical steps below. 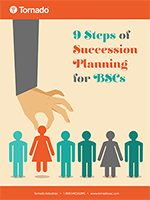 Or download our White Paper – 9 Steps of Succession Planning for BSCs for the complete article. Read our White Paper — 9 Steps to Succession Planning for BSCs. Click this link to download the PDF. Write down the critical positions in your company (these likely go beyond top-level executives), the value each brings to the company, and the skills needed for each. If these job descriptions don’t already exist, now is the time to create them. Look for future leaders within your current staff. Review resumes and ask managers for input about their employees’ skills and work performance. Administering skills- or personality-assessment tests to all employees may also help in this process, too. For positions with no obvious replacements, figure out where the gap lies. Could an existing employee eventually fit the bill with targeted training? If not, make a note of the type of talent needed, and seek it out as you hire for open positions. Finally, put your findings in writing. Create an organizational chart with a list of potential successors for each position, broken down by readiness (immediate, one to three years, five or more years). Creating a formal plan is particularly useful in family businesses. It illustrates to family members that they aren’t entitled to a job, but must earn their place on the org chart. Once the plan is in place, it’s time to start working it. This starts by sharing the plan, your goals in implementing it, and your vision for the company as widely as you feel comfortable. Telling employees they are part of the plan can deepen their commitment to the company and reduce the likelihood of them looking elsewhere for advancement opportunities. Next, create a training program to fuel the talent pipeline. Leadership workshops, on-the-job training, conferences, and the like can help fill the gaps between where employees are and where they need to be. Consider assigning a mentor (or manager) to each employee identified on the org chart. This person can help map out a career path and develop a training plan. The more you can individualize the training, the better. This makes it easier to help employees improve their personal strengths and shore up their specific deficiencies. Training isn’t cheap, but remember that promoting from within is more cost-effective than hiring from the outside. New employees start at the bottom of the learning curve, which results in a loss of productivity while they get up to speed. One study found that external hires were 61 percent more likely to be fired, were paid more, and got lower marks in performance reviews than internal hires. The bulk of a succession plan can be implemented quickly. What may take time, however, is dealing with the future exit of the owner. Preparing for the transition following retirement or death is best handled by a lawyer. They can help draft legal documents, such as a buy-sell agreement and stock redemption agreements, based on your corporate structure. Getting this paperwork formalized may take a considerable amount of time, so don’t delay this step. Ensure long term health for your company. Smart succession planning goes well beyond finding one suitable replacement for the CEO or owner. It should consider the future of all critical positions in the company. The following guide contains nine critical steps for BSCs to implement a formal succession plan. ← Are Battery Backpack Vacs Right For You?